Discussion in 'Amps and Cabs' started by EdM, Feb 9, 2012.
and my lord... what a beautiful sound! I usually use this blackline Fender for playing at home. It was inherited from my father and I don't want anything to happen to it. Then I bought this pedaltrain mini for no reason other than it was on clearance. I strapped a couple pedals to it including this BB Preamp and holy wow is it an amazing sound. I now want this to replace my head and 4x12 rigs for gigging. I'm just worried that getting to rehearsal/gig volume, the Deluxe would get too dirty. It is going to rehearsal with me next week to see if it can keep up. I'm so excited that I had to share. Maybe a more efficient speaker or ext cab will help the DR keep up. Yes. I will try it with a 2x12 8ohm cab. Good idea. Try an ancient MXR Micro Amp in front of an ancient Blue MXR 6 Band Graphic EQ .... I know what you're thinking right ? Noise. The MXR Miro Amp cancells the noise from the 6 Band . Try it. I have a 1970 Deluxe Reverb. You can also add round bottom end to the speaker with the 6 band EQ getting rid of any fllub. Thats what I also use in front of my Marshall Amps that are non master volume. I bet it'll rock your world! If it's not enough, get a quieter drummer. It already is. Less is more i guess. 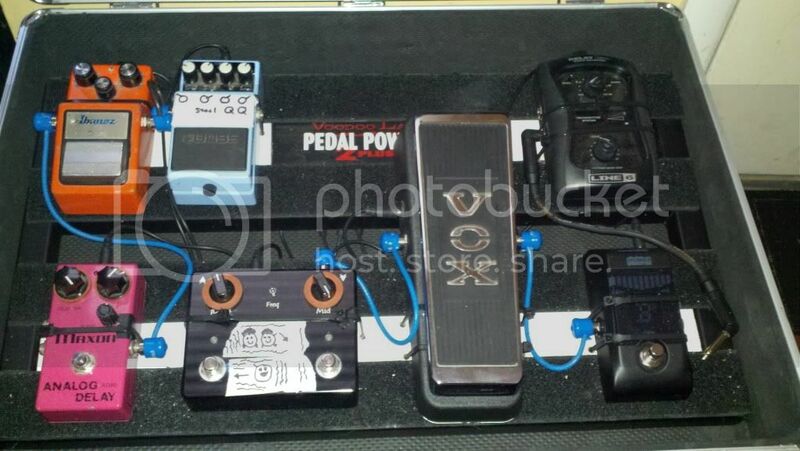 Here is the simple pedalboard I made with my extra pedals laying around. Also attached a pic of my pretty amp. Finally the monstrosity of a pedalboard I use with the gig rigs. I hope this little rig works. It will be so much nicer. Our drummer is LOUD btw. I guess I have no idea how to upload pictures. Oh well! set up a photobucket account. Yup. I pasted the URLs from the pics I uploaded to photobucket. Hmmmm. I had a '69 Deluxe (originally my Dad's)... I used it on the road from 1993-1998, then in a local band from 1998-2004 until I traded it off. GREAT gig amp! I never had it past 3 on the volume... All my grit came from multi-fx pedals, which the Deluxe handled better than any other amp I've played. 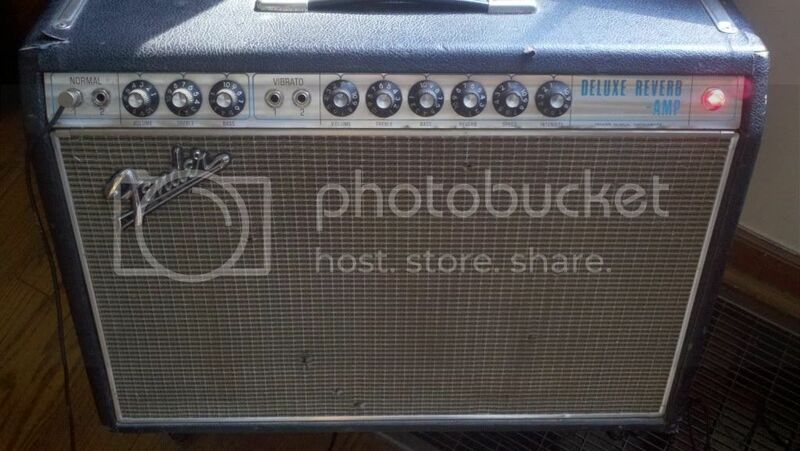 Yeah, that's a great amp.... Don't trade it off like I did mine! Trying again. And tele_jas... my amp will never go anywhere except to my daughter who plays too. Boom - Dirt - Squash......Love it!!! Yeah.. my mother bought it for him brand new when he was gigging. My ex bought me a dano pedal once. Nice of her but not quite 67 deluxe reverb nice. For what it is worth, I'd rather still have my dad but I know what you are saying. I'm lucky he held on to this. He had plenty of other gear that is floating around with others. Permanent loan type stuff. I wish I knew what, where, and with whom.